Tarantula hawk wasp dragging a tarantula spider to its doom. Tarantula eating a mouse and pretending to blow in the wind to throw off predators. 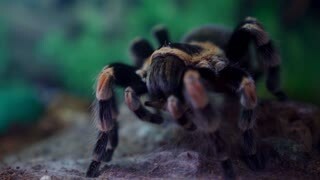 1970s: Tarantula moves fangs. Fangs and mouth of tarantula spider. 1970s: Tarantula straddles branches on driftwood log. 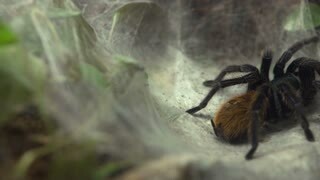 Arrows point to abdomen of tarantula. Spider sits on web. 1970s: Spider sits on leaf. Legs of spider grasp leaf. 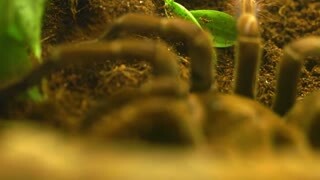 Tarantula crawls on log. Tarantula legs. 1970s: Hairs on tarantula legs. Spider's clawed feet. Tarantula straddles branches of driftwood log. 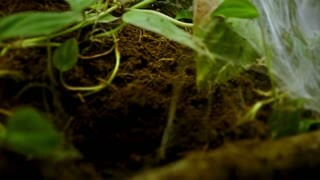 Close up view of exotic, dangerous tarantula in a terrarium. 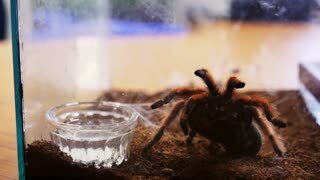 Exotic spider, risky situation. Hobby, danger, phobia. Being scared, fighting fear.